Lease plan published with permission. Toronto's Yorkdale Shopping Centre has done what many thought was impossible, by adding world-class luxury stores to a suburban Canadian mall. Traditionally the domain of Canadian downtowns, Yorkdale has changed Canada's luxury game with an unprecedented number of new boutique announcements. Canada's first free-standing Bulgari, Moncler and Jimmy Choo stores will join other Canadian firsts, including David Yurman, Mulberry, John Varvatos and others. Adding to this is a Holt Renfrew store with several large luxury shops-in-store, creating an upscale shopping destination unrivalled in Canada. Canadian luxury retail has customarily been located in Toronto's Yorkville area, and to a lesser extent, in Downtown Vancouver's 'luxury zone' around Burrard and Alberni Streets. As recently as the late 1990's, Montreal had a luxury zone on Sherbrooke Street that has since disappeared. Large Canadian shopping centres are generally mid-priced, save for a few upscale stores at Vancouver's Oakridge Centre, Toronto's Bayview Village and Sherway Gardens, and a handful of other regional malls including Calgary's Chinook Centre. Some American malls, on the other hand, feature rows of luxury stores. The most comprehensive of these is southern California's South Coast Plaza, featuring dozens of the world's top designer names. The Bal Harbour Shops (Florida), Houston Galleria (Texas), The Mall at Short Hills (New Jersey) and others offer luxury shopping unheard of in Canadian malls, until the rise of Yorkdale. Yorkdale's mall-fronting Chanel store is actually a Holt Renfrew concession. Photo credit: Holt Renfrew. Only a few years ago, Toronto's Yorkdale was an upper-middle class mall anchored by a 68,000 square foot Holt Renfrew store. That has since changed, thanks to hordes of increasingly affluent shoppers and tourists, as well as a proactive management team at landlord Oxford Properties. The mall's interior has helped as well: it boasts a primarily one-level floor plan with high ceilings, natural light, and the potential for dramatic store facades that are lacking in many malls. Bulgari: This Italian jeweller's first Canadian location will open in August next to Mulberry, across from Holt Renfrew. Occupying over 1,800 square feet, Bulgari will feature some of Yorkdale's most expensive accessories. David Yurman's first Canadian store opened at Yorkdale in December of 2013. The company is scouting for Canadian retail space, including on Toronto's Bloor Street West. Photo: David Yurman. Moncler: This French-Italian clothing and sportswear retailer will open its first Canadian store in a 2,540 square foot space, replacing half of the 4,660 square foot, mid-priced fashion retailer, Mexx. Moncler opens in September. Jimmy Choo: We previously reported on Jimmy Choo's new Yorkdale store, located in the other half of the former Mexx space. At 2,250 square feet, Canada's first free-standing Jimmy Choo will open in July, steps away from the Jimmy Choo shop-in-store at Holt Renfrew. Montblanc: Yorkdale's Montblanc will be the second for Toronto. The 1,220 square foot boutique joins its flagship Bloor Street location in Toronto's tony Yorkville area. Montblanc replaces Marex Jewellery, and will to open in August. Versace: Canada's only free-standing Versace store will occupy 2,820 square feet, opening in August. A Versace shop-in-store is also located in Vancouver. Michael Kors: Canada's top-selling Michael Kors store will also become its largest: the retailer is relocating from its 3,080 square foot space to one of over 5,700 square feet, replacing Eddie Bauer. The replacement Kors store opens in September. Yorkdale scored a handful of Canadian luxury firsts, including David Yurman, John Varvatos and Tory Burch. The mall's luxury roster also includes a 3,830 square foot Salvatore Ferragamo store, the second Canadian location following its Vancouver store, which has operated for decades. Holt Renfrew boasts a number of luxury concessions with mall-facing entrances. 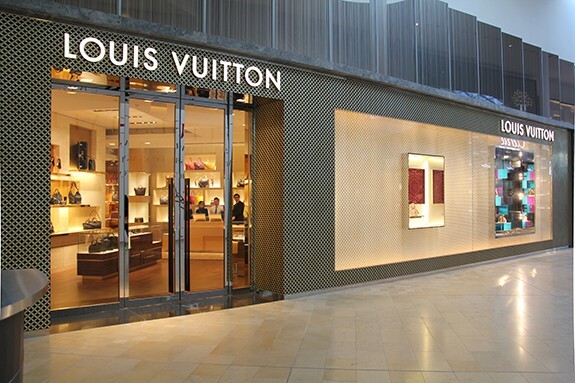 Chanel, Prada, Gucci and Louis Vuitton all have branded facades, with the appearance of being free-standing stores. Holt's also features in-store shops for Miu Miu accessories and, soon, Dior and De Beers. It will be interesting to watch other Canadian malls as they become luxury centres, not unlike those in America. Vancouver's Oakridge Centre is a luxury contender, featuring Tiffany & Co., Max Mara, and a host of other upscale stores. Calgary's Chinook Centre also continues to move upscale, opening stores such as Burberry, Tiffany & Co., Max Mara and others. Yorkdale beats them all and given its proactive management team, it's unlikely that another Canadian mall will rival Yorkdale's luxury offerings. Yorkdale is expected to become North America's highest-selling mall by 2018, with annual sales estimates of $2 billion. With Nordstrom's new 191,000 square foot store and a new 110,000 square foot retail wing, Yorkdale's $1 billion annual sales will increase substantially. Its Nordstrom expansion won't be the last for Yorkdale, however: plans are in place to replace its former Sears store with more retail and as many as two new anchor stores.